Next time I get some exciting idea for a knitting project that requires a bunch of finishing involving extra fabric and sewing machine etc., just say two words: “laptop bag”. That should get me to back away slowly. 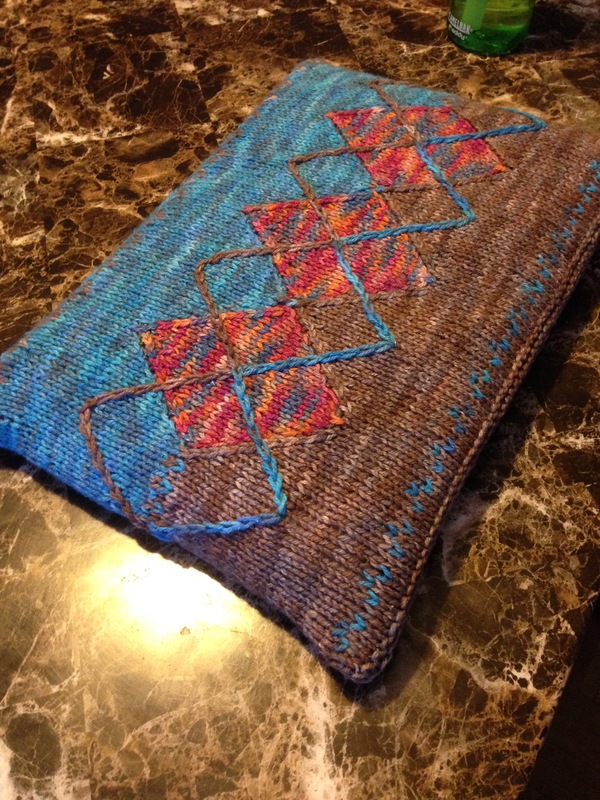 ﻿The knitted bag pictured above is adapted from an Interweave Knits pattern called Grace’s Bag; knitting described here. Today was entirely structured around giving me four continuous kid-free hours to assemble the liner necessary to turn this floppy bit of knitting into a functional laptop bag. I wanted to do this thing right, so I consulted nobody, came up with a half-baked idea, and started cutting without measuring properly. You know, my usual. 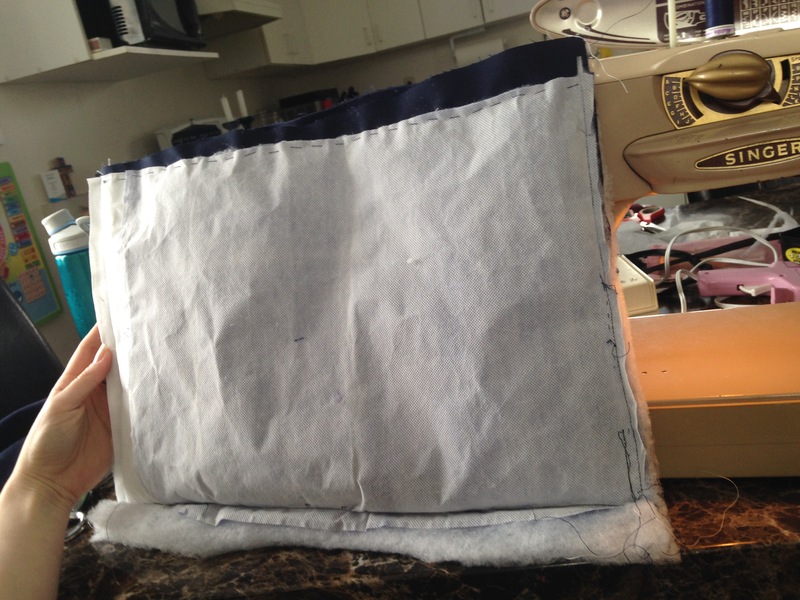 At least this time my half-baked idea was pretty simple: two rectangles sewn together with a zipper on top. It was made annoying by the composition of said rectangles. I wanted a laptop with some substance, not floppy, but feeling like it offered some protection. 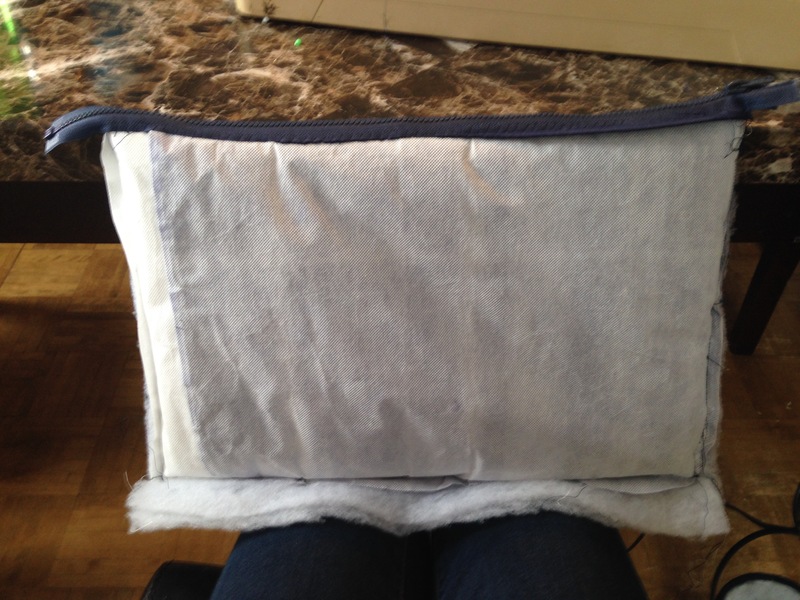 So I bought some nice fleece-lined polyester for the inner lining, and bulked it up with two layers of quilt batting, and for an outer layer I cut up an old grocery bag. It kinda makes sense right? This was seriously unwieldy to measure, pin, and cut. The new sewing pins I had bought could not handle it at all, and my sewing machine had fits. In the end, it only worked out because of a lot of basting, and because I had purchased some leather needles for my sewing machine in anticipation of a different project idea long ago abandoned. 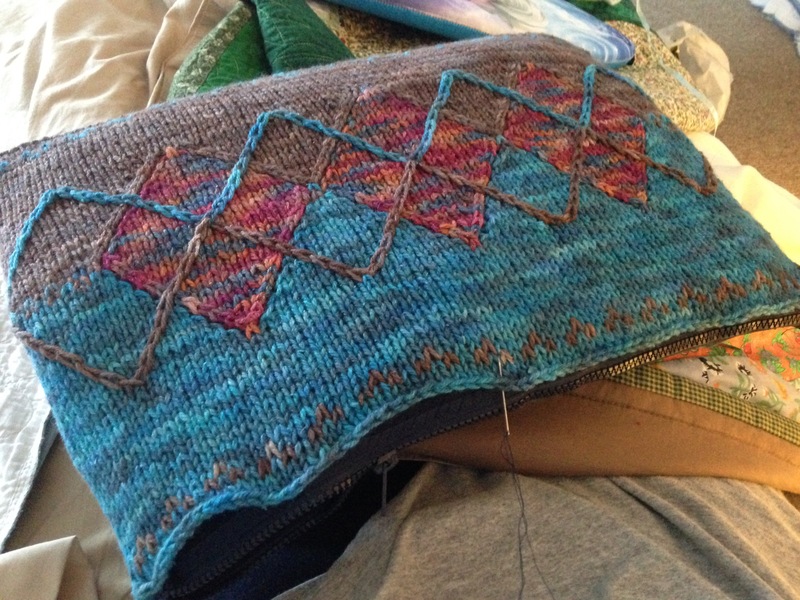 I thought my knitted bag was a little wide, so much so that I had this crazy plan for making an extra side pocket. But once I put in all these insane layers of padding, it fit just right in width and was in fact quite short. 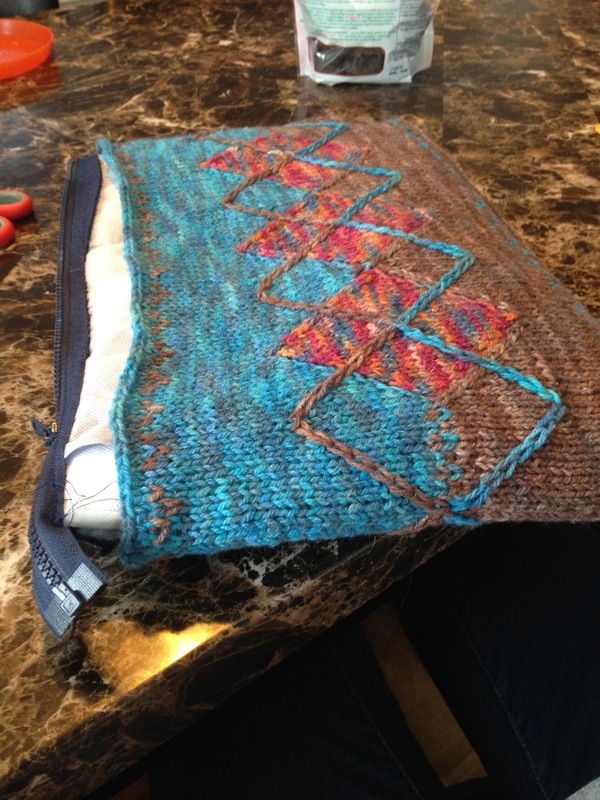 Thankfully knitted fabric is stretchy, and I attached it over the zipper with some secure whipstitch. 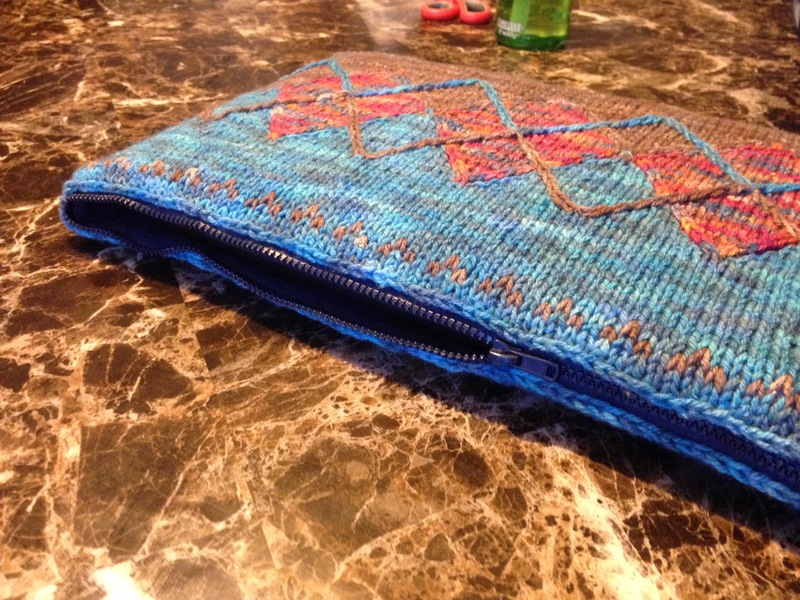 If there’s one thing I’ve learned about sewing from hanging around with Inuit it’s this: when in doubt, whipstitch. All’s well that ends well, I guess. Even though I don’t enjoy machine sewing, I am glad I have the basic knowledge – I won’t say competency – to execute these basic things. 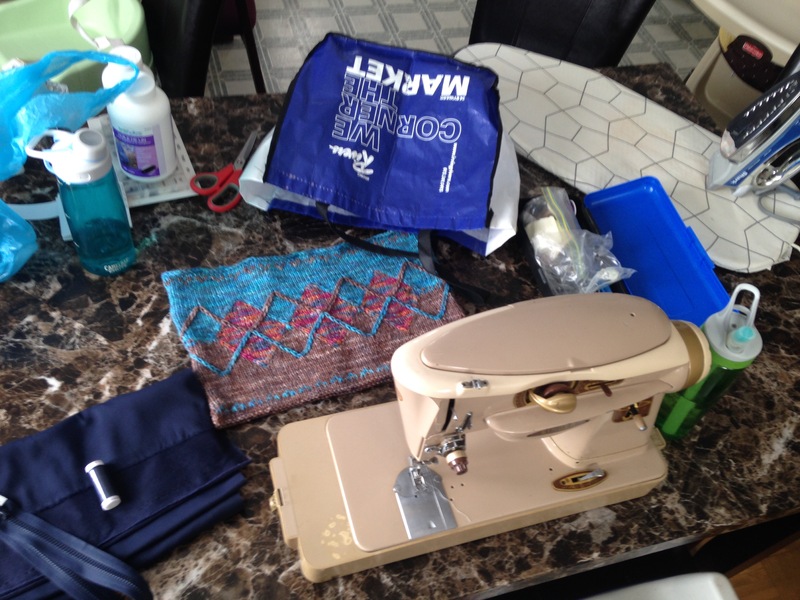 I could like machine sewing, if it fit into my life better, if I were more thoughtful about my tools and project selection, and if I sought out a supportive sewing community. In the meantime I will enjoy my awesome new laptop bag. Just don’t let me get any ideas about making another one.